According to the National Institute on Alcohol Abuse and Alcoholism (NIAAA), more than four out of five Americans over the age of 18 report having consumed alcohol at some point in their lives, and one in four reported binge drinking within the past month at the time of the study. For millions of people, alcohol consumption can create a form of dependency that may make it difficult to drink less or even to stop after recognizing the negative impact alcohol has on people’s physical and mental health. To understand how alcohol affects our behaviors and actions in social situations, we surveyed over 1,000 Americans about how many alcoholic drinks they needed to consume to feel comfortable approaching people in public spaces, how drinking affected their relationships, and how it changed their feelings toward other people. Curious as to what the science is behind alcohol as liquid courage, and why you might not want any after all? Continue reading to find out. If you’re at a bar and see an attractive person across the way, the idea of going up and talking to them might be intimidating. You may feel nervous and convince yourself not to approach them. Unless, of course, you’ve had a few drinks – then that outcome may change. While alcohol may feel like a form of liquid courage, it acts as a depressant and hinders people’s central nervous system (CNS) from performing certain tasks, including the ability to think, process emotion, and reason with reality. In addition to lowering inhibitions, alcohol's impact on the CNS can include memory lapses, hazy thinking, and slow reaction times. More than 1 in 4 Americans said they would have to consume two drinks before they were comfortable enough to approach someone at a bar. Nearly 1 in 5 said it took three drinks, and more than 5 percent said it took five drinks or more before they considered making contact. much did you have to drink? How quickly did you drink it? How old are you? How often do you drink in general? The answers to these questions can impact the range of consequences you might expect to experience after having too much to drink. 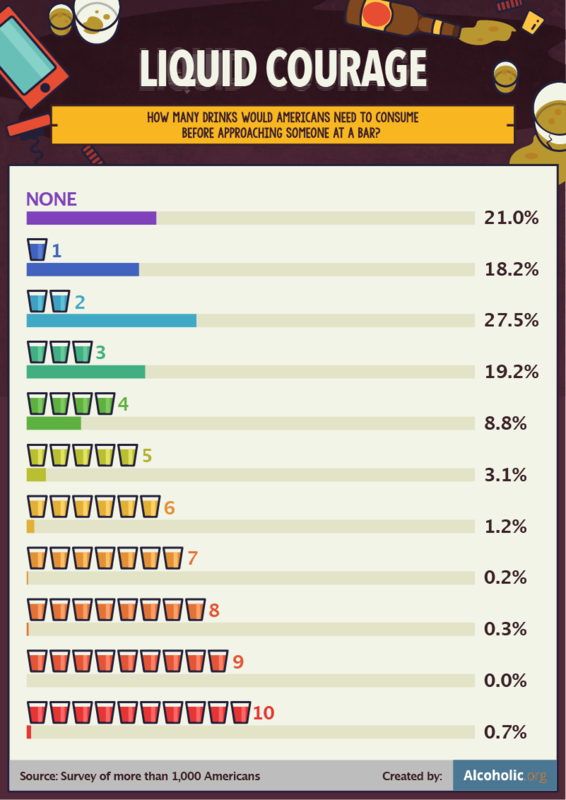 According to our survey, Americans in the West South Central region, including Texas and Louisiana, acknowledged drinking the most (more than two drinks, on average) before feeling comfortable enough to approach someone in public. 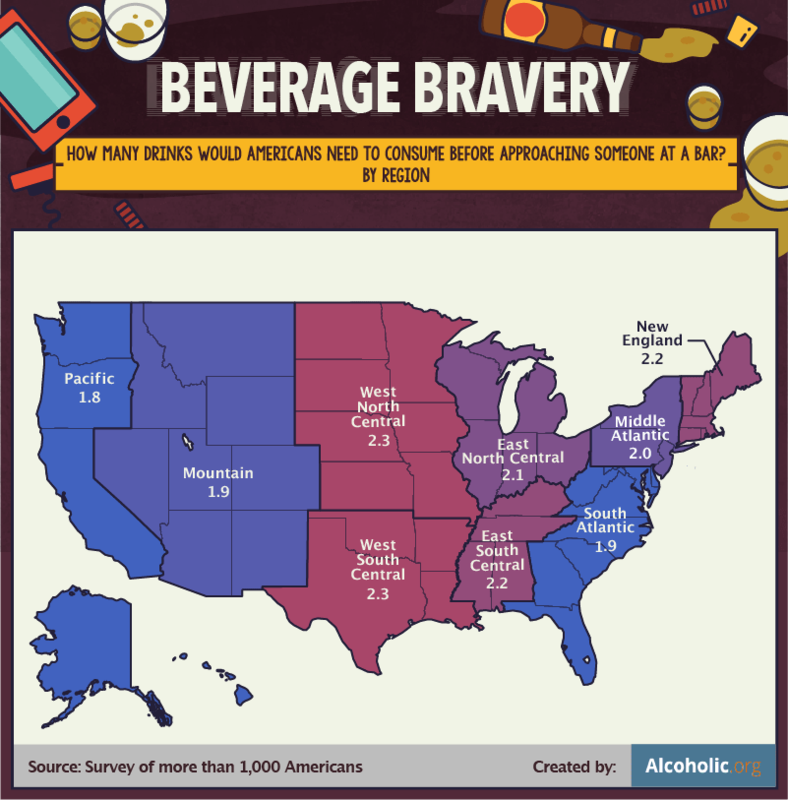 People from the Midwest, including Illinois, Ohio, and Michigan, also indicated needing more alcohol to feel courageous, whereas people from the Pacific and Southeast regions (including Washington, California, Florida, and Georgia) drank the least in these social situations. While women are sometimes more susceptible to the mental and physical effects of alcohol, men told us they needed to drink over 9 percent more alcohol, on average, to gain the courage to strike up a conversation with someone at a bar. Our survey also revealed younger people drank more than older generations to feel comfortable in social environments. On average, people between the ages of 20 and 29 drank more than two drinks to feel comfortable approaching someone at a bar. One study revealed nearly a third of Americans with an alcohol dependency were young people, over half of whom had been diagnosed with antisocial personality disorder (ASPD). For them, drinking in these situations may be a coping mechanism, not just a personal preference. We also asked people to indicate based on their current relationship status how much “liquid courage” they thought it would take to approach a stranger in public. 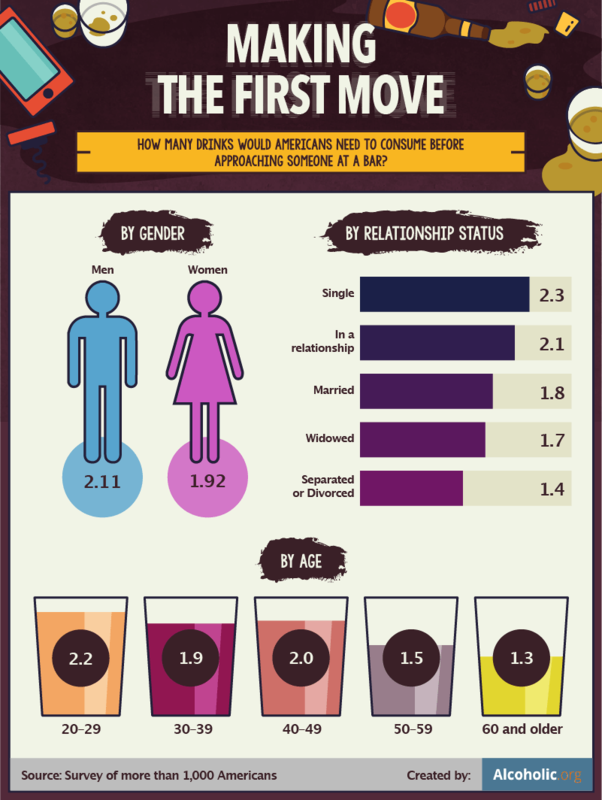 Our survey revealed that single people drank more in order to approach another person at a bar than those who were either married or in a relationship, and nearly twice as much as someone who had been divorced. Drinking too much may impact the brain's ability to function properly, which can cause people to make decisions they otherwise might not have considered. Excessive drinking can damage the connections between the ventral striatum and the prefrontal cortex, which regulate how we engage with compulsive behavior. Essentially, a person who has had too much to drink may not have full control over their decision-making – and that includes sexual activity. 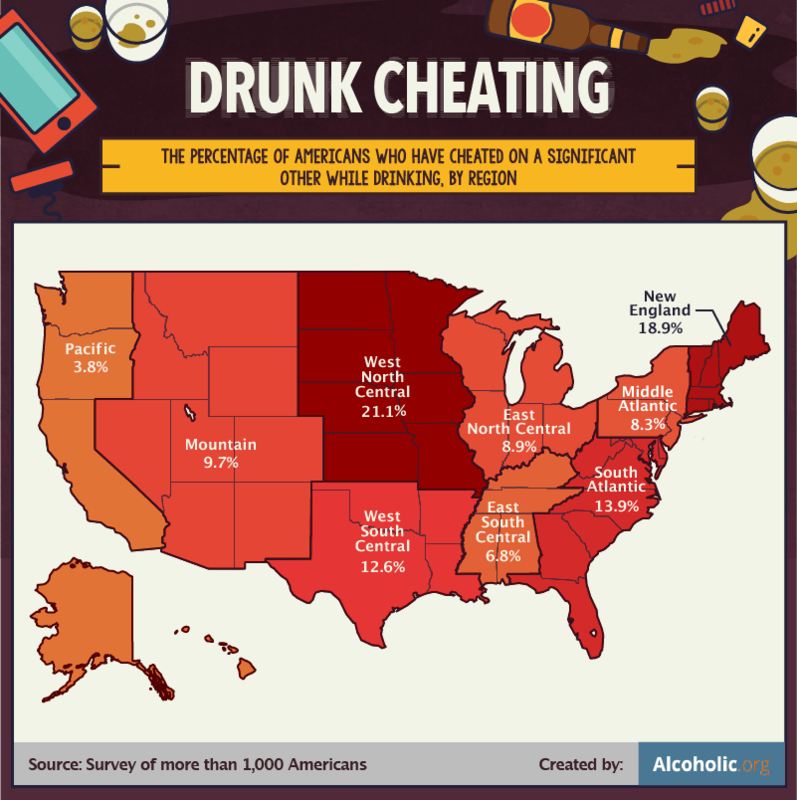 More than 1 in 5 Americans from the West North Central region, including Minnesota, Iowa, and Missouri, admitted to cheating on a significant other while under the influence of alcohol. Nearly 1 in 5 people from New England, and less than 1 in 10 people from the Pacific region and areas of the South, including California, Alabama, and Tennessee said the same. Women indicated they were only slightly more likely than men to cheat on their significant others while drinking. 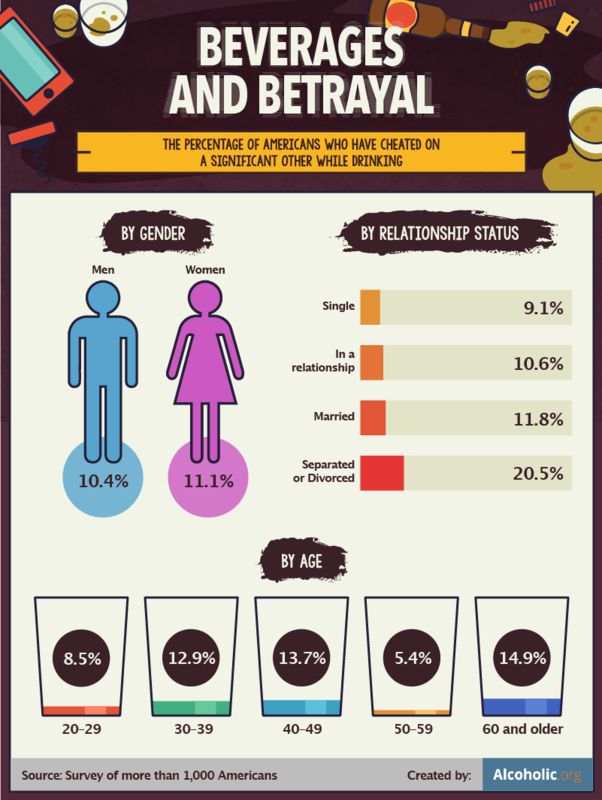 Roughly 1 in 10 people polled (regardless of gender) had cheated on their partners while drinking. More than 1 in 5 Americans who were currently either separated or divorced also cheated on their significant others while under the influence of alcohol, while more than 1 in 10 people who were either in a relationship or married said the same. Beyond cheating, the effects of excessive drinking can lead to other sexual consequences, including STIs or unplanned pregnancies. People aged 60 or older were the most likely to cheat on their partners while drinking. Some research suggests that our bodies may become more sensitive to alcohol as we age, which means the same level of alcohol can have harsher consequences (both physically and mentally) for older Americans than younger adults. If you find yourself feeling more flirtatious while drinking, it isn’t just a coincidence. Sexuality and our sense of love or lust are controlled by certain elements of the brain. The orbitofrontal cortex (OFC) controls whom we find desirable, and alcohol can have a profound impact on how the prefrontal cortex (including the OFC) operates. More than half of men and women said drinking alcohol made them more flirtatious, and nearly half said it made them more affectionate. Some people were significantly more likely than others to feel flirtatious after drinking. 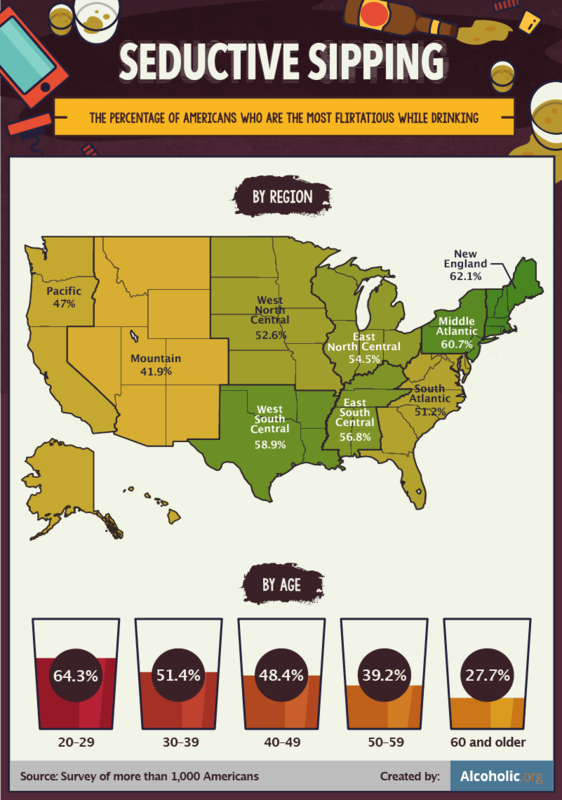 Over 60 percent of Americans from New England and the Middle Atlantic region, including Maine, New York, New Jersey, and Vermont, felt extra flirty after having a few drinks. 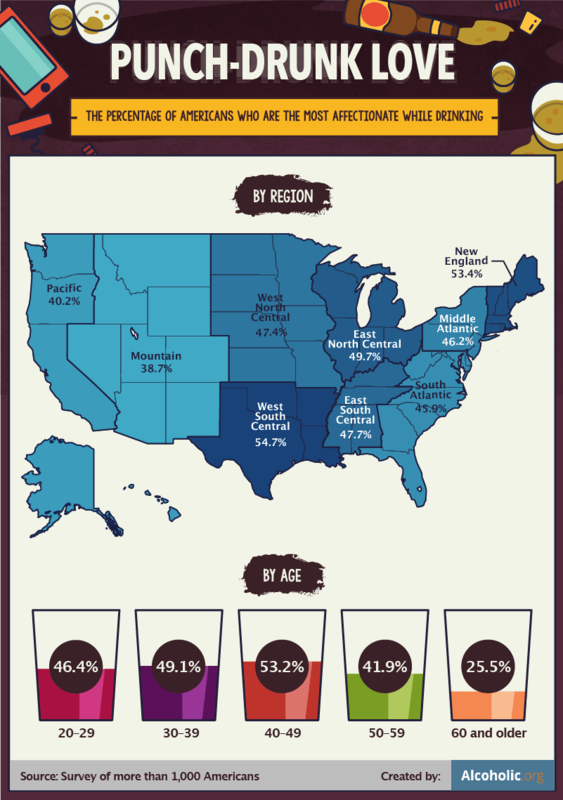 While more than half of participants under the age of 40 across the country said the same, only those from the Mountain and Pacific regions (including Nevada, Colorado, and California) were less likely to flirt with the people around them just because they had a few drinks. Younger people were also more likely to flirt when they were drinking. 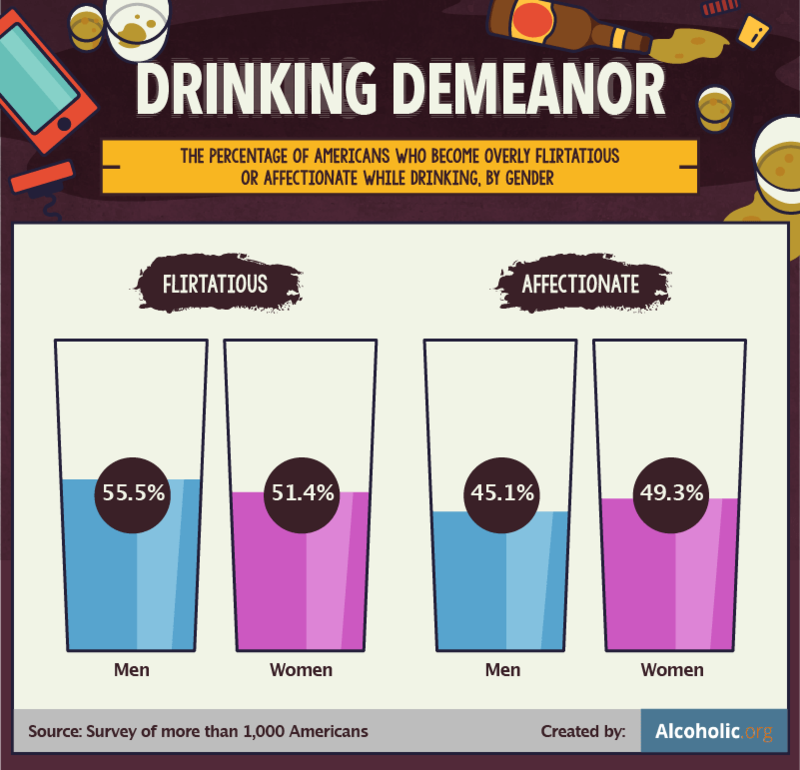 Over 64 percent of respondents between the ages of 20 and 29 became less reserved and a little more flirtatious when they had something to drink, compared to roughly half of those between the ages of 30 and 39. While Americans were more likely to be flirty than affectionate after drinking, people across the country reported feeling more caring after having a few drinks. Flirtatious behavior may be more likely to lead to physical relations or intimacy, while affection is more indicative of a platonic relationship. People we surveyed under the age of 50 told us they felt more affectionate towards other people after they’d been drinking than than those over the age of 50. More than half of people between the ages of 40 to 49 said drinking made them feel more affectionate, while a little over 1 in 4 people 60 and older said the same. Feelings of affection were strongest in the West South Central region, including states like Texas, Arkansas, and Louisiana, and were weakest in the Mountain region, like New Mexico, Arizona, Utah, and Colorado. There are many ways alcohol can affect the brain. From the things we do and the people we do them with to what we remember about it afterward, drinking can have significant consequences once the night has passed. Americans believed they needed a certain number of drinks to engage in social situations, but their actions and moods also occasionally changed while drinking. If you or someone you love has become dependent on alcohol, Alcohol.org can help you regain control. Our treatment advisors are available to discuss all treatment options, from rehab to inpatient and outpatient detox centers. We believe in making the detoxification process as simple as possible so that you can get on the road to success today. Visit us online at Alcohol.org to learn more. We surveyed over 1,000 Americans about how drinking influences their behaviors and relationships.